Hopefully, you’re one of the 42% of content marketers who document their content marketing strategy. Which means that, before you create any piece of content, you know who you’re creating it for and what channels you’ll use to promote it. But, is knowing this enough? This information gives you a head start, but it’s just that. As a content marketer, you need to do better than this. For each piece of great content that you invest in, you need to know how it’s going to support your content marketing strategy. At any point, you should be able to answer why you chose a particular topic and the results that you expect from it. In this post, I’m going to show you a few ways of choosing the right topics and setting goals for them. Let’s start with setting goals for individual content pieces. To make a content piece successful, start with the end in mind. You can do this by defining what you expect from it. Listing the goals for a piece of content will help you decide if you’re making the right content at the right time. To assign goals to your blog posts, videos, infographics and more, you should refer to your organizational content marketing goals and see how a potential content piece maps to it. So, to evaluate a topic, see how it stacks up against the bigger goals. Content geared toward lead generation appeals to the audience segments in the later stages in their buying journey. Generally, these people know your brand and are somewhat engaged. Content aimed at getting backlinks is good for such content goals, as it draws in a lot of referral traffic. Example – One of my Quick Sprout posts — Get Your MBA in Internet Marketing with These 12 Guides and 2 Courses — attracted many backlinks, which, of course, helped more people discover me. Content meant for ranking well is built upon a healthy mix of keywords. Mostly, such posts target long tail keywords and aim to reach the top SERPs. Example – A good example of such content is Brian Dean’s post on the reasons Google hates sites. This post ranks in the first position when someone searches for this long tail keyword. Brian WANTED to rank for this keyword, because he found people on forums who were searching for it a lot. By showing up as the first search result for this key phrase, Backlinko’s brand gets noticed by highly targeted traffic. Content that aims to engage existing users mostly shows how people are maximizing a product. Example – Evernote is known for its active and engaged community. A big part of this engagement is driven by Evernote’s content. Evernote understands their users well, so they cover content themes, like their “Taking Note” series, where they discuss the history and styles of note taking. To Evernote’s users — lovers of all things note-taking and organizing — this content is thoroughly engaging. Content created for brand awareness doesn’t necessarily have to be tightly knit with your business. By exploring content topics that can go viral, you can get exposure before newer, broader audiences. Example: Here’s a fun post that you wouldn’t really expect on an otherwise serious blog. It has got 310 shares on LinkedIn alone. When you research the different types of content to try, remember that some types of content can be used to meet multiple content objectives. Take webinars, for example. You can use them to assert yourself as a thought leader, attract new audiences, and also push advanced users to buy. Of course, the subjects of your webinars will be different. 66% B2B marketers cited “Developing targeted content by buyer stage/interest” as one of their greatest challenges in lead nurture programs. The key to developing the right types of content for people in the different buying stages is in understanding the stages well. Buyer’s journey stage #1: Awareness – During the awareness stage, your audience identifies that they have a problem that they need to solve. For example, if you run a small business invoicing solution, your potential buyers, in their awareness stage, realize that they need a system to manage invoices. Or, it might be that they discover your solution and know that they need something like it. Users make searches, like “the best invoicing solutions for small businesses,” at this stage. When people discover you, as a result of such searches or via other channels and if they’re interested in your service, they enter the second stage in their buyer’s journey, which is the evaluation stage. Buyer’s journey stage #2: Evaluation – The evaluation stage customers know about what your solution can do for them – but they want to know if you’re the best option out there. To go back to the invoicing solution example, your prospects in the evaluation phase will compare your product with the other small business invoice management tools. Next, the buyers who like your product over the alternatives will enter the final stage of their buying journey — the purchase stage. Buyer’s journey stage #3: Purchase – The purchase-stage buyers are ready to buy. For the invoicing solution we’re discussing, people in the purchase stage will signup for a free trial or demo. When you understand the journey of your buyers, you develop better insights into what their concerns are at different times in their journey. Matching your content with the different buyer stages ensures that your content is relevant to them at all of the strategic points in their buying journey. 32% of b2b marketers segment their content based on the buying cycle stages. Doing so helps them to offer the right kind of content to the buyer in the relevant buying stage. The following buyer journey shows the different content types that map to the different buyer stages. The above insights aren’t of much use, unless you choose the right topics to go with them. So, for our invoicing example from above, consider that you’ve taken into account your broader content marketing goals, studied your buyer’s journey and have selected a few types of content to develop. Let’s say that you chose to develop a white paper for the buyers in the first stage; a case study for the second stage and a free consultation for the third stage. Well … now you need the “real” topics to cover. While the buying stages give you the high-level view of the types of content that you want to create – they don’t help at all with coming up with topics. 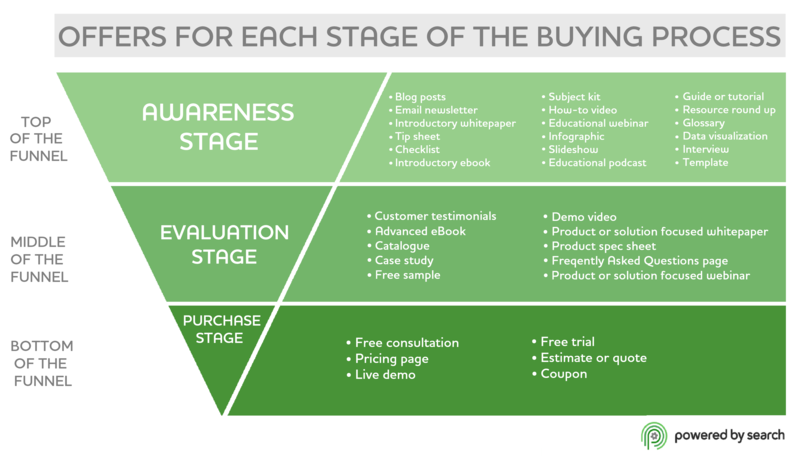 The buyer stage will tell you that you need a white paper to attract buyers in the awareness stage. But, it won’t tell you about what topic you need to create it around. To find topics, you need to turn to your customers. And, here’s where personas come into play. When you create your user personas, you can identify their needs and goals. Your content should always be about helping them in these two areas. 63% of b2b marketers use buyer persona to create content; 40% use them for content segmentation. I’ve given step-by-step instructions for creating user personas in this tutorial. It also shows how you can use them to generate potential content topics. After you identify the different content types that match with the different buyer stages and personas, you might start creating too many of them. Maybe you find yourself cranking out one white paper after another, or perhaps you end up focusing on just webinars. Of course, you’re making the right content, but the problem with this approach is that it’s not well-rounded, which means it’s unlikely to get you spectacular results. Instead of focusing on just one type of content promotion, spice up your content with different types. As Curata notes in this infographic, B2B marketers need varied types of content, like white papers, eBooks, webinars, case studies and videos to get great results. For your niche, you need a healthy mix of content types to cater to users in the different cycles of their buying journey. Other than appealing to different audience segments, throwing multiple content types in your marketing plan mix also helps you to attract more traffic. When you create content, look for points in your buyer’s journey where you can support your content (or “branded” content) with user-generated types of content and expert content (reviews by third-party sites or other authorities). I understand that it’s not always possible to have a bandwidth to support so much content. But, here’s where tactics, like repurposing content, come to the rescue. When Buffer repurposed some of their best posts into an email course, they got 17,817 signups. It’s easy to confuse content promotion formats with types of content. These ideas sound a bit fuzzy sometimes. Some people use them interchangeably, too, adding to the confusion. Based on the above classification, an event would be a content promotion format while a webinar would be a content type. Once you know the content promotion formats that your audience will consume the most, you should then come up with several content types that fall under that format. Note that there’s certainly some overlap between the two concepts. When people repurpose great content, essentially, they’re just changing its format. If you research the different content and social media formats, before choosing content types, you’ll also get a head start with repurposing, because you’ll know your audience’s preferred content promotion formats. As I said in the beginning, documenting a content marketing strategy is just the beginning. No matter how detailed it is, it can’t take care of your day-to-day decisions, like deciding if a topic is a good match, how it could be repurposed for use on social media or for choosing one format over the other. For these, you need to question each topic and see (if and) where it fits in your buyer’s journey, how it’s relevant to your audience and in what format it will be the most snackable. You’ll also want clear goals for each piece, to help you decide if a topic really took off. Setting goals and measuring the success of each topic will help you tweak your content strategy from time to time. I hope the above tips will enable you to make confident choices, when choosing topics for creating content. How do you map your content pieces with your content marketing strategy?